Bernard Piffaretti was born in 1955 in Saint Etienne, France, and has exhibited regularly in France and abroad since 1983. This will be his first solo show in New York. Piffaretti defines his work as a rigorous exploration into the implications and dynamics of the painting process itself. 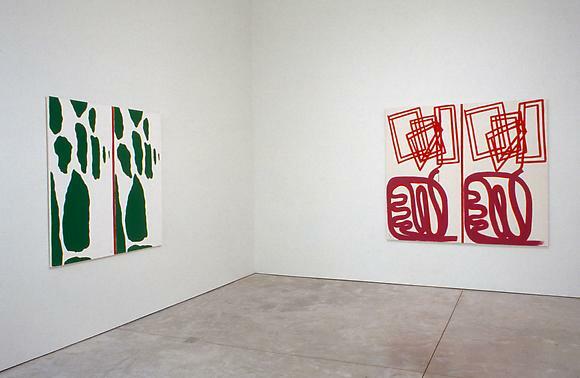 His radical approach evolved partly in response to expressionist New Figuration of the early eighties, and like Daniel Buren and Niele Toroni, he has been concerned with revitalizing the possibilities of abstraction, clearing painting of all personal and historical mythology, and questioning the pictorial act. Concerned with duplication as both form and working method, the artist starts by dividing the blank canvas into two equal halves with a vertical line: on one side of the line he creates the "pattern," and on the other, its replica. Whether he begins on the left or right, the second side is always submitted to all the actions that occurred in the first. The forms are simple and infinitely varied and they are often chosen in contrast to those of the last painting executed. Geometric forms, straight or sinuous lines, flat colors as well as grids, hatching, and superimpositions render style and manner irrelevant and produce unique pictorial situations. The unmixed paint applied in thin layers possesses the flat tones of industrial paint, and gesture is reduced to the most neutral expression, with no hesitation or pentimento. meticulous copy. From one painting to the next the process remains the same. However, each painting, though tied to the painting before, is singular and resembles no other. Through this paradoxical exercise of dissimilarity in similarity, Piffaretti keeps pictorial expression and its subjective charge at a distance. The process of duplication, seeming to have no aim other than to be exercised, becomes a pretext for putting the act of painting itself into question. The idea of creation becomes the object of an active banalisation, foiling the endlessly recurrent issues of style, chronology and model. The pictorial process itself is the basis of the work.